I must admit, I do like a cup of tea. Now days, 8 out of 10 times I’ll take a cup of oolong, OP or golden Tips over a beer. And I’m not alone, as it turns out our plants like tea too… compost tea! As we don’t use herbicides, pesticides and any other nasty chemicals to grow our trees and plants we have to find more sustainable and natural ways to feed them. This starts buy making or mixing our own compost from cardboard, food scraps and grass with a lot of help from our chickens who do all the hard work in the compost making process. We don’t weed (weeds are not your enemy) but instead chop and drop and that goes to pruning, everything goes back to the trees (they are cannibals) to feed them and help them grow. This is just accelerating what naturally occurs in a forest and is perfect for our permaculture food forest that is now approaching its second year. 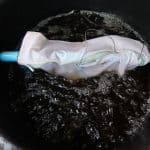 I heard of the untold benefits of compost tea from Youtube, one of my main sources of education is, John Kohler’s – Learn Organic Gardening at Growing Your Greens Channel. 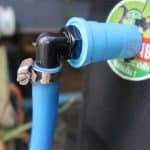 His overly long ‘Best DIY Compost Tea Brewer Made with a Garbage Can & PVC Pipe’ can be viewed here. On his channel he mentions the open source plans to build a compost tea brewer made available from the Oregon State University. 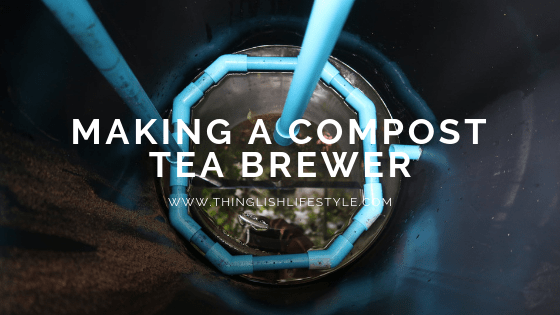 As I completed the OSU’s online course ‘Introduction to Permaculture’ I download their plans and built a 100L compost tea brewer, with a few modifications. 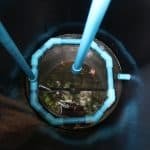 The compost tea brewer bin is filled with rain water and then all the ingredients are added into the mesh bag and submerged. The air pump is turned on and the brewing begins. I let the compost tea brew for 12-18 hours before checking, and then let it continue for at least 24 hours in total. When we have a nice, fresh brew I simply fill up a watering can and apply to the plants, the base and leaves all get a drink. 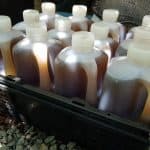 I also bottle it up in old milk jugs and transport it to our farm for the new plantings, although we will be making another compost tea brewer for that site soon. The trees and plants get a nutritious drink in the easiest form for them to use to grow and stay healthy. It also improves the soil’s fertility. When we took over the farm, we inherited 10 durian trees which were all about 18 months old. They all had a bad infestation of aphids. I naturally assumed that this was because the trees where lacking something in their diet and were unable to defend themselves. The old farmers told me to spray some chemicals on them, but that isn’t our way. First, I mulched the trees with wood chips as the ground was bare around them. The sun would stress the roots with its heat. The mulch would retain more moisture and reduce this stress. Secondly, I sprayed each and every leaf from trunk to branch tip with compost tea. I gave them two applications, two weeks apart. That is all it took to eliminate the aphid infestation. What aphids that are there now, are controlled and managed by beneficial insects that eat them. We’ve also added irrigation to all the durian trees, so they all get regular water and we have now seen considerable healthy growth on all the trees, but did the compost tea get rid of the aphids? I’d like to think so. Later, watching another video, this time on the Stefan Sobkowiak YouTube channel confirmed to me aphids were not the problem, they are an indication that the trees are lacking in some nutrients or unbalanced fertility (or an excess of nitrogen). Watch Stefan’s ‘Aphids are an Indication’ video here. 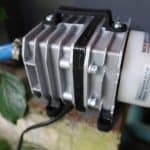 If you want to make your own compost tea brewing machine, I would suggest you download the Oregon State University open source Compost-Tea-Brewer plans to get started. The download contains the plans, specifications and their compost tea recipe. Give your plants a treat!